“HISTORY IS PAST POLITICS, AND POLITICS IS PRESENT HISTORY” (E.A.FREEMAN, 1886). This is a brief account of the history of Somaliland from a historical perspective. The history of Somaliland is peculiarly different from the history of Somalia. Those who argue against the present state of independence and sovereignty outrightly ignore how Somaliland is Historically differentiated from other Somali Inhabited Territories. Somaliland has an ancient history and civilization. For a long period in the past, Somaliland had well-established trade links with the rest of the world particularly ancient Egypt (the Pharaohs), the Romans, the Arabian Peninsula and the Indian sub-continent. Commodities like hides and skins, frankincense and myrrh, ivory, gums, feathers were traded in exchange for consumer products such as sugar, tea, dates, clothes etc. It was uniquely the hub of spices trade (Frankincense and Myrrh). The trade links to the Middle East and East Asia existed via the Red Sea and the Indian Ocean routes. With the introduction of Islam, and later on during the spread of the Ottoman Empire, trade firmly set foot along the coasts of Somaliland. For instance, between the 10th and 14th centuries Chinese merchants frequented the coast of Somaliland and Egyptians had a long historical relationship with Somaliland. In the 16th century, Zeila was occupied and annexed by the Ottoman Empire as a port town. In the 1880s Europeans (Britain, Italy and France) began disputing with each other for control for spheres of political influence in Africa. At the turn of the 19th century, when the Ottoman Empire weakened was on the brink of collapse, Egypt which was a vassal of the Ottoman, Empire occupied the western parts of Somaliland. Following the British occupation of Aden in 1839 and after the opening of the Suez Canal in 1869, the expansion of the British Empire was brought to the doorsteps of Somaliland. To safeguard its trade interests in the Indian Ocean, during the scramble and partition for Africa between the Europeans, in 1884 Britain proclaimed Somaliland as a protectorate ‘British Somaliland Protectorate’ and appointed its first agent in 1885. British of Somaliland was the result of series of agreements with the local traditional elders and chiefs. Britain accepted to occupy Somaliland to act as fiduciary. The raison d’etre for the occupation was largely for the protection of the colony. For administrative purposes, Somaliland was divided into five administrative districts in the protectorate (Berbera, Hargeisa, Burao, Erigavo and Zeila). 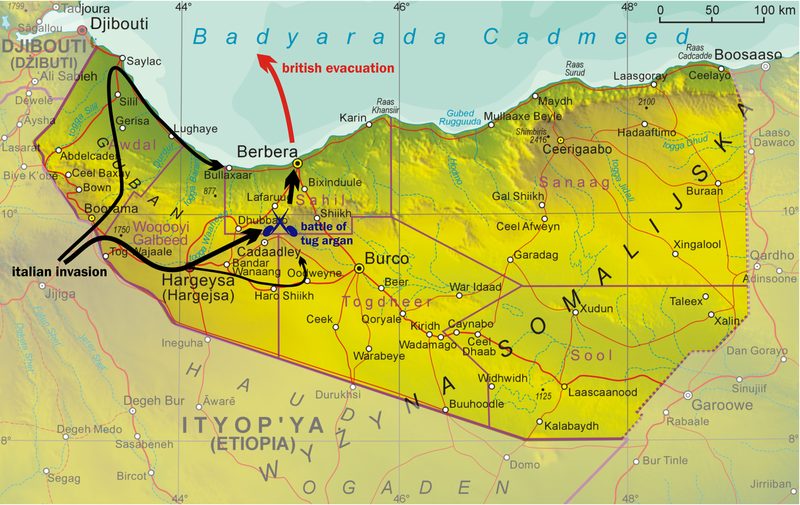 Italian Invasion of British Somaliland, August, 1940: During the East African Campaign in WWII, British Somaliland was occupied by Italy for six months, when British forces recaptured the protectorate. From the British point of view the occupation the purpose of occupation was utilitarian: a) to use it to play a key role of the increasing Empire’s control of vital Bab-el Mandab strait for the security of the Suez Canal and the safety of the Empire’s naval route through the Red Sea and the Gulf of Aden to East Asia, and b) to provide meat especially mutton to the British garrison based at Aden. However, from the Somali traditional chiefs and elders point of view, the occupation was for the safeguard of the security of Somaliland. For centuries, people of Somali ethnic origin in the East or Horn of Africa region have been practicing nomadic pastoralism wandering in transhumance mode moving within the entire region in search of grazing pastures for their stock to exploit the production system of pure nomadism. That led to the spread of Somalis region ending in different parts of the region (Ethiopia, Kenya, Somalia, Somaliland and Djibouti). But nevertheless, Somali people, wherever they live, share a common identity in terms of the language (Somali), religion (Muslim) and socio-cultural matters. There never has been a common or single nation within a defined territory at any one time and Somali nationalism only began with colonialism which eventually steered to the rise and emergence of the concept of bringing all Somalis in the region under one unit or nation. Somali people had always relationships with neighboring communities. The relationship between Somalis and Ethiopians existed since the 13th century. On arrival of European colonialists in Africa, Menelik, the Emperor of Ethiopia, showed his interest that he had to have a share in the partisanship of Africa as an imperial power in the region. The Emperor voiced that he would not be watching the European powers dividing and having shares of the African continent for themselves and that as a ruling kingdom, Abyssinia should also have its share of the cake. The Europeans allowed that. As a matter of fact, the Empire had always an eye on the neighboring territories including the Somalis. Earlier in 1889, Emperor Menelik together with Ras Mekenon (his Governor of Harar region), annexed the Somali-inhabited parts. Before the British formally occupied Somaliland, a series of agreements and treaties with the local chiefs and clan leaders preceded. Britain first made treaties with the different Somali local tribes in 1827, followed by others in 1840. Between 1884 and 1886 alone, at least six treaties and three supplementary agreements were signed with the elders of different clans. In all of them, Majesty’s protection was guaranteed. It is noteworthy to mention that a number of agreements were held on board of ships off the coast as the local people did not allow the British to land before signing any agreement. A system of indirect rule of Somaliland was first established. Somaliland was initially ruled from India and later on through the colonial office after it transformed the regions into a protectorate. In 1894 Britain and Emperor of Ethiopia (Menelik) made an agreement the instrumental aspect of which was that the Emperor would, in return, not support the Mahdi of The Sudan who was fighting the British. Emperor Menelik always had a project to extend full authority on Somali-inhabited lands known as the Ogaden. His successor Tefari Mekenon, later renamed as Haile Selassie as popularly known took the thrown in 1928 had full control of Somalis in the region and insisted to consolidate his ambition. But during the Dervishes movements led by the Sayed Mohamed Abdulle Hassan, there was a hindrance to freely invade the entire Somali region. After the end of the Dervishes struggle, another part of Somali-inhabited areas (Haud and Reserved Area), a vast area of grazing lands of Somaliland and its Somali population, were handed to Ethiopia by the British. As Somaliland became part of the British Empire there was the necessity for the defining and delimiting the borders of the protectorate with the neighboring territories of Ethiopia, the French territory of Djibouti and Italian Somalia. 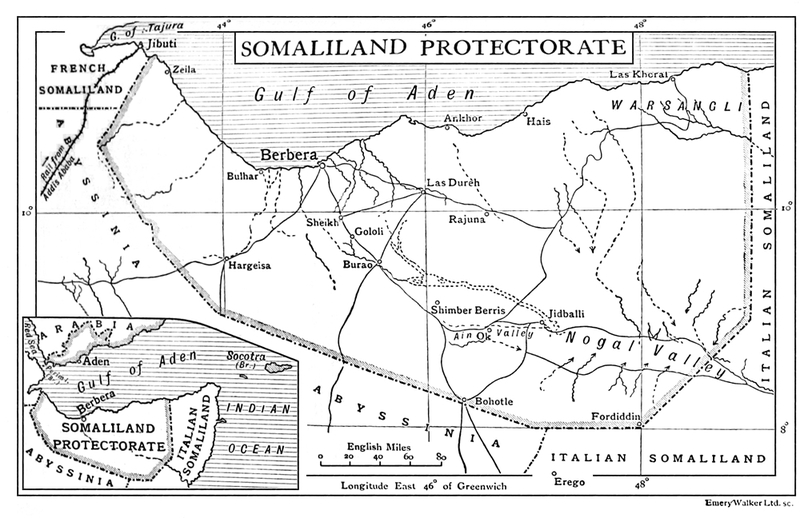 Since different parts of Somali-inhabited regions were colonized by different European colonial powers (British, Italian and French) the borders and contours of the British Somaliland protectorate needed to be determined. Britain made legal agreements and international treaties with the French, Italy and Ethiopian Emperor through the Anglo-French treaty of 1888; the Anglo-Italian treaty in 1894 and Anglo-Ethiopian treaty 1897 respectively. Therefore, Somaliland as a British Protectorate had established borders as enshrined by those treaties delimiting its international boundaries with the neighboring territories (the Ethiopian Empire, Italian Somalia in the South and the French Somali territory of Djibouti (presently the Republic of Djibouti). The borders of Somaliland at the present are the same as they were during its protectorate years, the same during its independence years from the British Crown in 1960 and same as they are today as the independent Republic of Somaliland. 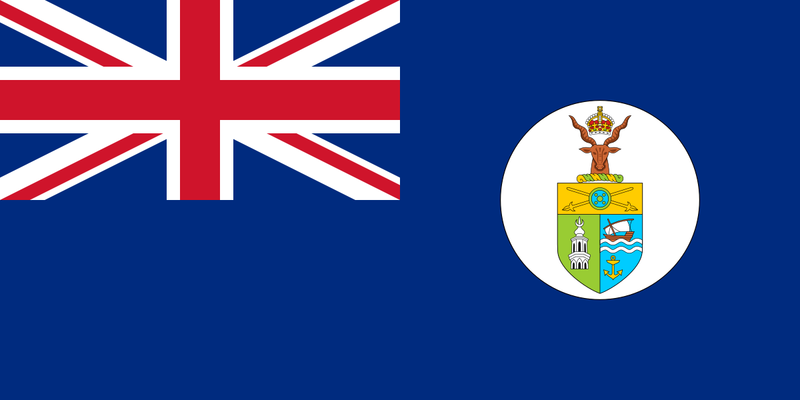 The British established a protectorate over Somaliland in 1884 and garrisoned it from Aden. The protectorate was administered from British India until 1898, then by the Foreign Office, and after 1905 the Colonial Office. As in all their colonies, the British recruited indigenous peoples into their armed forces to maintain security. When this photograph was taken the British were engaged against the forces of the so-called ‘Mad Mullah, Sayid Mohammed Abdullah Hassan, who had led a revolt against British rule since 1899. Historically, the Ethiopian emperors were always in pursuit to control the Somali-inhabited area as well as other nationalities in the area. The ‘mythical kingdom’ at Axum had always an interest to bring all nationalities such as the Somalis, the Arusans, the Oromo, the Herari, the Guraje, etc. under its control. For a brief period, In 1935/36, Italy took control of Ethiopia until the British re-occupied it again after the Second World War when the alliance of Italy and Germany were defeated by the allies. However, Britain withdrew as Ethiopia reasserted rule over the Somali population when Britain withdrew. In 1954 Britain handed over the ‘Haud and Reserved area’ to Ethiopia in 1954. Somaliland was declared a British colony in 1884, however, technically it was not so until 1920 when the Sayid, Mohamed Abdulle Hassan, the leader of the Dervish Movement who fought with the British colonial administration was defeated when a combined land forces (the Somaliland Camel Corps, the Somaliland Police, together with the 2nd and 6th Kings African Rifle (KAR) and contingents of Indian Battalions and air offensive. It was then it became a full-flexed protectorate. In due course and over the time, Somaliland identity began to take a formal shape. The beginning of a sense of nationalism and Somaliland’s national identity is very much rooted in the colonial experience. Nevertheless, Somali people share common cultural and political identities. The British always allowed the tribal leaders and chiefs to run local affairs in their traditional ways and the colonial authority left the traditional structures and culture of the society in place. The other colonial regimes (the Italians and the French) had interventionist policies into the Somali societies they colonized that showed tendencies in interfering with the lives of the Somali societies. During the colonial period, the protectorate was administered by colonial political agents, commissioners, administrators, and Governors during the colonial period (about 21 in total) between 1884 and 1960. The last British Governor, Sir Douglas Hall (a military Governor) was in Hargeisa from 11 July 1959 and handed over to a native Somali Governor, Osman Ahmed Hassan on 26 June 1960. Somalia was put under 10-years UN Trusteeship in December 1950 with Italy as the administrator power to prepare them for independence. Italian Somalia saw different Italian administrators or Governors. The last was Mario Di Stefani (1958 to 1960). The Trust Territory of Somalia had its first general elections in March 1959 in which 83 out of the 90 seats in the Legislative Assembly were scooped by a single party, the SYL. In the late 1920s, the first political organization (the Somali Islamic Association) was established in Aden by members of Somaliland origin in the diaspora for the purpose of promoting the discussion of the Somali community issues in Aden and question of the British rule in Somaliland. Later on, in the early 1930s, as a spillover from this organization, clubs were organized in Somaliland in Berbera and Hargeisa. Hadiyatul Rahman’ (God’s gift) Association was opened in Berbera and ‘Al-Khairiya’ (the blessed) Association in Hargeisa. Members of those clubs dared to wage critics to the colonial administration. Further politicization of the clubs led to the formation of the Somali National Society (SNS). 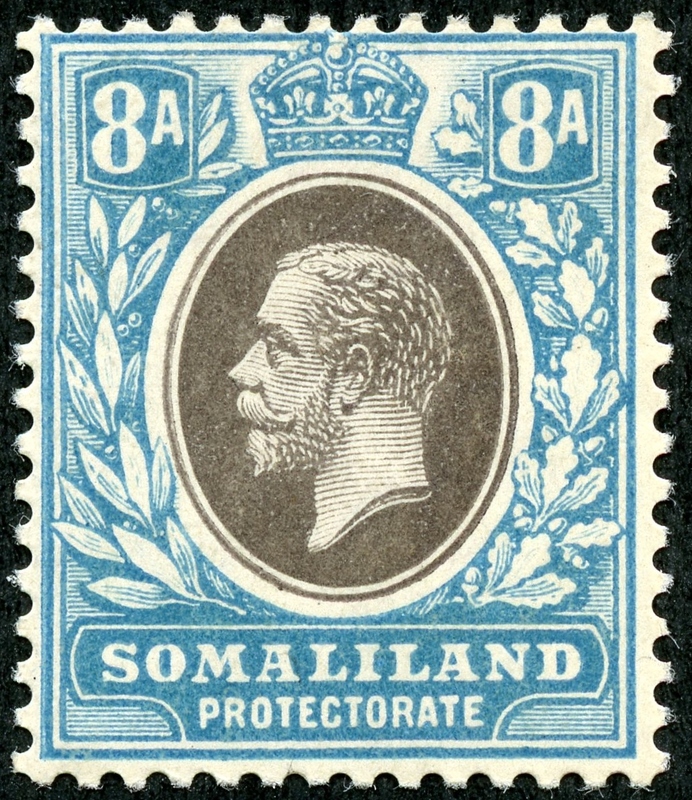 At the end of the Second World War, four of the Somali-inhabited territories with the exception of Djibouti which was a French colony), i.e., the British Somaliland Protectorate; Somalia, the Northern Frontier District (NFD) ruled together with Kenya as British colony and the Somali region in Ethiopia together with Haud and Reserved Area all fell under the British rule. As nationalism grew, a wholehearted popular vision, converging aspirations and a strong wish of the people in the intention developed. The union between Somaliland and Somalia was considered as pursuit of the ‘Greater Somalia’ dream and the rise of Somali irredentism in bringing all five territories inhabited by ethnic Somalis in East Africa (the Ogaden and Haud and Reserve Area under Ethiopian Empire, the Northern Frontier District – NFD – part of the British colony with Kenya, the French colony of Djibouti, the British Protectorate of Somaliland and South Somalia under Italy). The idea of unifying Somalis or the Greater Somalia concept was politically advocated by British. At the end of the Second World War, Ernest Bevin (a British Foreign Secretary, a post-war British politician and statesman) suggested that all Somali-inhabited territories, with the exception of Djibouti which was under the French, became under the British rule. Britain replaced Italy to rule Ethiopia after its defeat in WWII. In fact, the entire East Africa region was under the British colonial rule or Empire. It was on April 1961 that Bevin made the proposal and argued that all Somalis be united as one “The best way for the wandering Somali pastoral nomads to survive in the marginal environment was to let them united all under the British Administration”. But on the international level, the British plan was rejected the other big powers (France, USSR and USA) as they were suspicious about the British intentions that it would undermine their interests and influences in Somalia. The Ethiopian Emperor also protested. In relation to the unity of Somalis, Britain organized the formation of Somali Youth Club (SYC) represented by all Somali clans to convince Somalis. Meanwhile two prominent political figures from Somaliland protectorate, Michael Mariano and Adan? ?, were then also transferred to Mogadishu to write up the SYC (later changed to the Somali Youth League, SYL). The SYL had in its constitution the mandate of uniting all five Somali territories under one banner. In the end, a Somali Conference was organized in Mogadishu which was chaired by Sultan Abdillahi Suldan Deria from Hargeisa. But the idea of British administration (under the UN Trusteeship) was rejected by the politicians of Somalia as they wanted the Italians to implement the UN administration and not the British. Thus, the UN Security Council then transferred the trusteeship of Somalia to Italy to prepare them for independence after 10 years. The Somali region in Ethiopia, the Ogaden and the Haud and Reserve area remained with Ethiopia and in 1963, the NFD became part of independent Kenya. Bevin’s idea became an important catalytic precursor for the strengthening the concept of Somali nationalism and the Greater Somalia notion. The SNS underwent through development transformations and it finally changed to Somali National League (SNL) party. 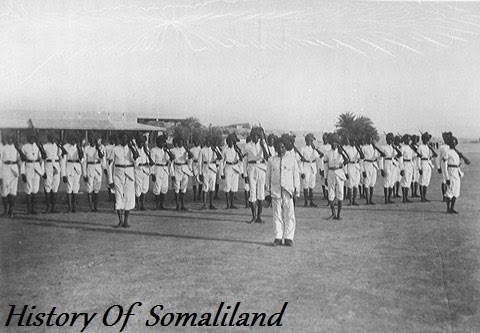 A combination of factors contributed to raising the consciousness and awareness of people of the idea of unifying all Somali territories: (i) from 1945 political campaigns spearheaded by the SYL party in the South; (ii) the suggestion of the British Foreign Secretary in 1946 to put Somalis together under a trustee in view to gain independence for all Somali territories and (iii) the issue of the Somali area known as ‘Ogaden’ which was ceded in 1897 to Ethiopia which temporarily became under British jurisdiction in 1947 but handed back to Ethiopia in 1948 (against the Somalis wish). These factors formed a cocktail of ingredients that sparked the Greater Somalia or Pan-Somalia concept or dream, so to speak, among all Somali speaking populations in the region. The ambition to struggle to achieve the unity of all five Somali-inhabited parts was clearly stated by the Somali poets and literature experts such as the late popular and famous poets such as Ali Sugulle Egal, Abdillahi Sultan ‘Timacade’, Ahmed Ismail Deria ‘Qasim’ and others. Is-raacin sida hubka is-wada (They must be united as one like an automatic weapon).” (Ali Sugulle Egal). 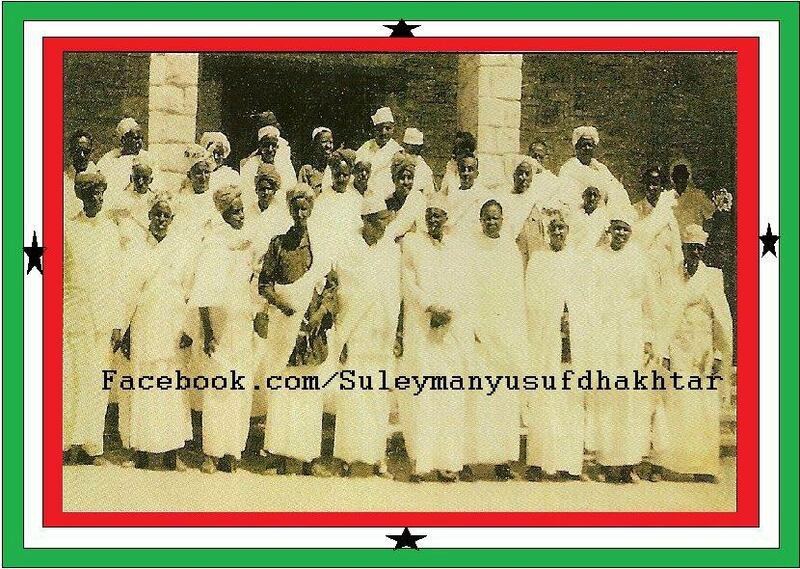 On February 17 1960, the very first Somaliland elections for parliament were held. Four major political parties – the SNL, NUF, USP and SYL – and a few independent runners contested for 33 national seats. 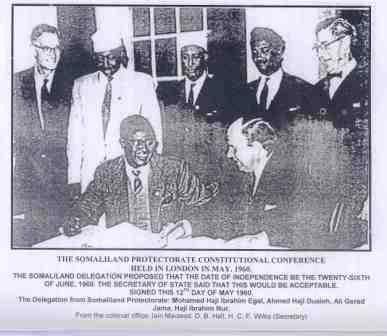 In 1957 a Legislative Council consisting of 8 official and 2 ex-officio (British) members, 6 unofficial (Somali) members was formed in Somaliland though the Council was established two years earlier (on 10 February 1955) because the Somaliland Constitutional Order came in force two years later (in 1957). In 15 February 1960, Somaliland’s first democratically elected parliament. The Council consisted of 33 natives (Somalis) and 12 non-natives of English and Indian and Arab origins. The names of the 33 Somali MPs elected were: 1) Mohamed Haji Ibrahim Egal (Berbera); 2) Ali Garad Jama (Las Anod);3) Osman Garad Mohamoud (Teleh); 4) Abdalla H Farah (Widhwidh); 5) Mohamoud Yasin Sh. Muse (Odweyne); 6) Mohamed Bihi Shuuriye (Hargeisa); 7) Mohamed Yusuf Geedeeye (Ainabo); 8) Abdillahi Hussein (Ina Doobikoole) (Hargeisa); 9) Ali Mohamed Haji Abokor (Faraweyne); 10) Sh. Barkhad Awale (Gabiley); 11) Jama Abdillahi Galib (Ina Diirqadhaadh) (Salahley); 12) Ahmed-Keyse Haji Duale (Buroa); 13) Michael Mariano (Eil Afweyn); 14) Mohamed Ali Farah (Hiis); 15) Abdillahi Qablan Mohamed (Las Korey); 16) Sh Ahmed Mohamoud Dalmar (Erigavo); 17) Ibrahim Eid (Hudun); 18) Mohamoud Ahmed Salah (Jidali); 19) Haji Ibrahim Nur (Dila); 20) Yusuf Ismail Samatar (Hargeisa); 21) Abokor Haji Farah (Buroa); 22) Yusuf Kahin Ahmed (Las Dhure); 23) Sh Ali Ismail Yaqub (Duruqsi); 24) Isse Jama Mohamed (Qoryaley); 25) Haji Yusuf Iman Guleid (Berbera); 26) Haji Abdillahi Deria (Sheikh); 27) Haji Ibrahim Osman Food (Adadley); 28) Haji Aden Yusuf (Bulahar); 29) Ali Qowdan (Mandhera); 30) Sh Abibakar sh Omer (Borama); 31) Jama Ghelle Isse (Zeila); 32) Haji Muse Ahmed Shirwa (Abdulqadir); 33) Abdi Hassan Buni (Boon). Towards the final years of the colonial period and in preparations for independence, legislative elections were held on February 1960. A number of political parties took part. The Somali National League (SNL) which originated from the Somali National Society (SNS); the National United Front (NUF aka NAFTA); and the United Somali Party (USP) participated in the elections. SNL won the elections with a sliding majority (20 out a total of the 33 seats contested); the USP party (12 seats) and the NUF party (1 seat). The first elected Legislative Council (Cabinet) were: Mohamed Haji Ibrahim Egal (First Minister); Garad Ali Garad Jama (member); Haji Ibrahim Nur (member); Ahmed Haji Duale (Ahmed Kayse) (member) and Haji Yusuf Iman (member). 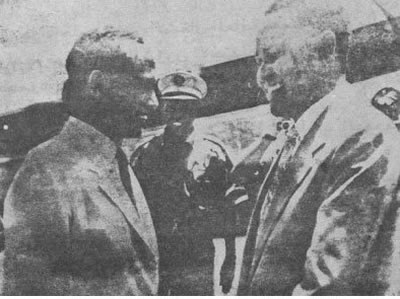 Mohamed H. Ibrahim Egal (right), the leader of the political leadership of British Somaliland welcomed in Mogadishu by the Premier of UN Trusteeship of Somalia Mr. Abdullahi Issa on April 16, 1960. The officer seen in the middle is Mohamed Siyad Barre who later lead the revolution that toppled the government of Prime minister Egal on October 21st 1969. On 6 April 1960 the Somaliland Legislative Council had a meeting (chaired by the Governor Sir Douglas Hall) in Hargeisa to discuss two items as agenda: 1) to discuss the independence of Somaliland and 2) the union with Italian Somalia. The two items were merged and discussed as a single item as they were closely related and because the concept of uniting all Somalis which was the main concern of the people. The two items were inseparable. Most of the constituent representatives especially the SNL members such as Mohamed Abdi Shuriye and Haji Ibrahim Osman Food (Basbaas) among others voiced strongly the union of Somaliland with Somalia. However, Philip Carl, a member of the council, despite understanding the emotions involved warned that there were other really important issues that needed to be discussed. Nonetheless, every other matter was overlooked in the session. The conclusion was the agreement to proceed to the union with Somalia. The Somaliland Council delegate members discussed whether or not to unite with Italian Somalia which was a UN trusteeship. Some members such as Garaad Ali Garaad Jama and Mohamed Ibrahim Egal openly suggested that should remain independent and wait for a while before joining with the South. Similar suggestions were reported to have been made by most politicians from the Italian Somalia council members. They found that the idea was a bit hasty and premature and even suggested for the northerners to buy more time. 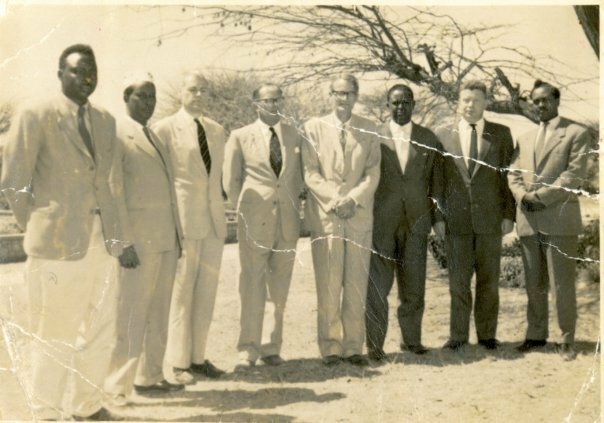 A Somaliland Council delegation consisting of 3 members (Mohamed I Egal, Garaad Ali Garaad Jama and Haji Ibrahim Nur with Lieutenant Abdillahi Aden ‘Congo’ as an overall security observer and advisor left for Mogadishu for discussion with the Government of Abdillahi Essa Mohamoud in the South which was the last government in the trusteeship period of 1956-1960). Matters developed in rapidity. The public anxiety pushed the leaders more to forge the union with the Somalis in the South. The Somaliland delegation was under extreme pressures from the public. They were instructed to bring a positive response (the union) back on their return from the South. Therefore, the overwhelming emotionally charged population in the Protectorate was the force behind that dictated the union deal with no strings attached to it. The main agenda was the union without the attachment of conditions or strings. On 2 May 1960, the Somaliland cabinet led by Mohamed Ibrahim Egal left for a ten-day constitutional conference in London to meet their British counterparts. The members of the delegation composed of the following members: Mohamed Haji Ibrahim Egal, Minister of Local Government and leader of Government Business; Ali Garad Jama, Minister of Communications and Works; Haji Ibrahim Nur, Minister of Social Services; and Ahmed Haji Duale, Minister of Natural Resources. The delegation was accompanied by a legal Advisor, Mr. Neil Lawson, and the Governor of the Protectorate, Sir Douglas Hall (K.C.M.G) and Mohamoud Abdi Arraleh (Secretary to the delegation). The Colonial Office was represented by Ian Macleod; D.B. Hall; and H.C.F Wilks (Secretary). The Somaliland delegation requested for independence. On 12 May 1960, a date was agreed and set for the independence of Somaliland protectorate to be on 26 June 1960. An agreement was signed on the day as an acceptable proposal. This date marks a historical time and a characteristic landmark for the people of Somaliland. In 1947 the SNL party of the North was campaigning for the amalgamation of all Somalis in the region to be united. That was mainly due to the fact that most of the Somali politicians feared of the negativity of ‘clannism’ as divisive in such a way that it would be exploited by foreign powers in the United Nations who were, at the time, in debates of the political destiny of the Somali people. Anything less than the wholehearted support for unity and ‘Greater Somalia’ would weaken the case of non-unification by the politicians was the dream. The overall intention of the unification of the two Somali territories was taken as a model step to the ultimate Greater Somalia ambition that became the byword amongst the Somalis. The politicians, had no other choice but to play that as a political card. The SNL’s campaigns before the election were mostly based on this fact in line with the popular political view. That also existed in Somalia. It was being pushed by the Somali Youth League (SYL). As the campaigns for independence of the British protectorate gathered momentum, the first Legislative Council, consisting of 6 Somalis and 8 British which was established in 1957, was increased to 33 elected official members in 1959. Mohamed Haji Ibrahim Egal, as First Minister or the leader of the Council and led Somaliland to independence from Britain on 26 June 1960 as an independent state, with its own constitution and a government headed by Egal was formed. 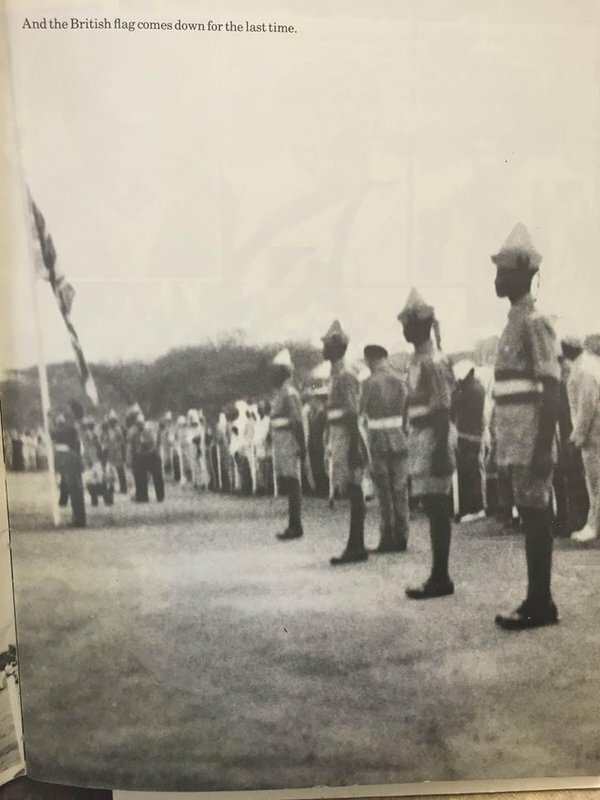 At independence, the last British Governor of British Somaliland Protectorate, Sir Douglas Hall, handed over the governorship to Osman Ahmed Hassan as the first native Somali administrator. 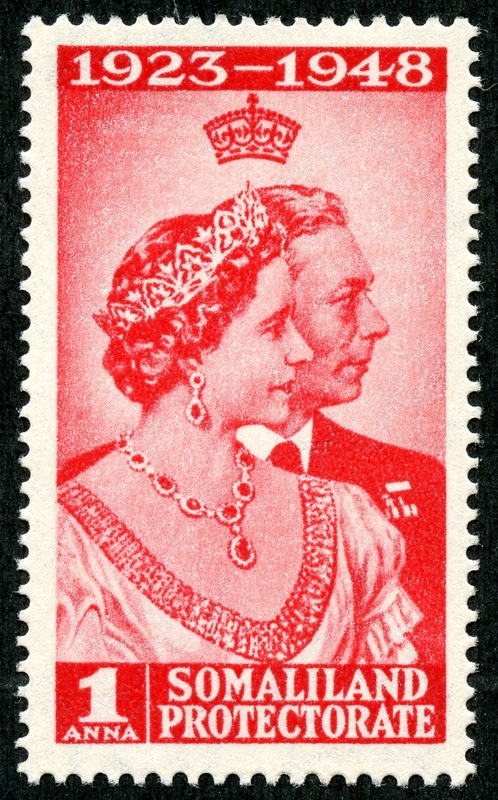 British Somaliland Protectorate was granted as an independent country on 26 June 1960. That year was famous for the phrase “the winds of change” within the British Empire as it was used in a speech by the then British Prime Minister, Harold Macmillan. Of the British colonies in the African continent, Somaliland became an independent state after Sudan (which became independent in 1956) and Ghana in 1957, while Ethiopia was never colonized. It was an imperial state. In its first session, the government of Somaliland voted for union with brothers in the South with an overwhelming Majority.